The struggling Tennessee Titans at 5-7 traveled to Denver last Sunday to take on the 10-2 Peyton Manning led Broncos and their high octane passing offense. The Titans highly ranked passing offense was sure to be tested while their struggling run defense was faced with a 2 headed monster in running backs Knowshon Moreno and rookie Montee Ball. The Titans knew they had to get the offense rolling to keep up with the Broncos who were leading the league in points per game. So how did they fare? Let’s take a look. The Broncos scored 51 points on the Titans defense and Peyton Manning went 39 of 59 for 397 yards and 4 touchdowns. He was not sacked and was only hit 3 times. The Broncos offense has turned the ball over a lot this year but it did not happen against the Titans. Manning posted an efficient 66.1 percent completion rating and a 107.8 passer rating. He averaged 6.7 yards per passing play. Looking at individual stats and it’s pretty clear most of the Titans secondary struggled against the Broncos passing game. 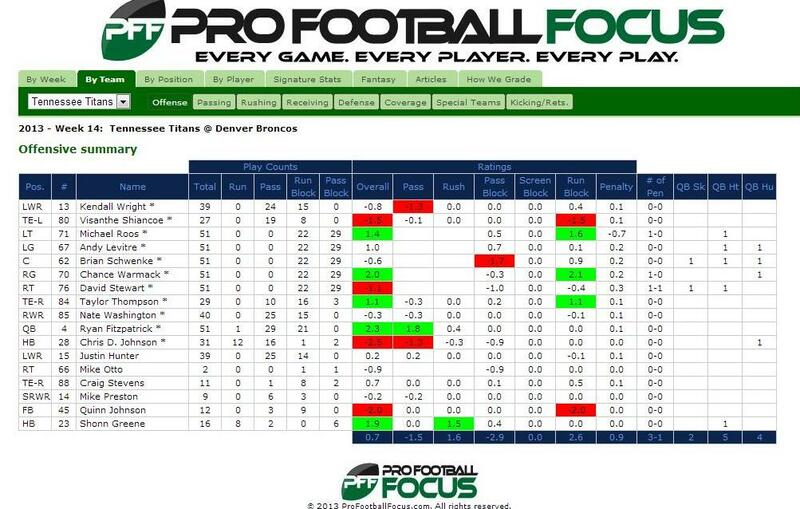 Wes Welker left early with his second concussion of the year but the Broncos are loaded. Wide receiver Eric Decker caught 8 passes for 117 yards and a touchdown and really took Alterraun Verner’s lunch money. Decker was targeted 12 times with 8 receptions, with 2 penalties from Verner and 117 receiving yards and a touchdown. He averaged 14.6 yard per catch. The tight ends got into the action too with Julius Thomas catching an 8 yard touchdown pass with free safety Michael Griffin in coverage. While he did score, the Titans limited him to 5 receptions for 35 yards. Tight end Jacob Tamme caught 4 passes for 47 yards. Manning targeted his tight ends 12 times in the game. Collectively they accounted for 82 of the passing yards. Jason McCourty on DeMaryius Thomas was a little better matchup but he also put up good numbers. Thomas didn’t draw any penalties but he was targeted 10 times and caught 7 passes for 88 yards and a touchdown. Thomas had the long catch of the game at 38 and averaged 12.6 yards per catch. Coty Sensabaugh gave up a touchdown to Wes Welker but kept him in check before he left late in the second quarter. He did draw one penalty too courtesy of Coty Sensabaugh. Welker caught 5 passes for 61 yards along with the touchdown and averaged 12.2 yards per play. The Titans run defense didn’t fare much better as Knowshon Moreno carried the ball 14 times for 78 yards and a touchdown. He averaged 5.6 yards per carry. Rookie Montee Ball had similar numbers carrying the ball 15 times for 77 yards and a touchdown. He averaged 5.1 yards per carry. Moreno had a long run of 25 yards. Both backs were active in the passing game catching 9 of 11 targets for 41 yards. The Titans offense wasn’t terrible and Ryan Fitzpatrick had a pretty good game. He did throw an interception but it wasn’t his fault. The Titans simply aren’t built right now to put up big numbers although they are headed in that direction. The offensive line play has been criticized but I see signs it is getting better. Rookie right guard Chance Warmack had his best game of the year and received positive grades all around from Pro Football Focus. Ryan Fitzpatrick went 13 of 24 for 172 yards, a touchdown and an interception. He was sacked twice. Beyond the fact that the Titans offense isn’t currently built to win a shootout, the big problem for the Titans offense was in the time of possession. They held the ball only 20 minutes of the game. The Broncos ran 91 plays while the Titans ran 48. They only had 15 first downs, converting 22% on third down and 66% on fourth down. They were tackled for a loss twice in the run game for a loss of 12 yards. The good news from the game is that rookie wideout Justin Hunter posted his second 100 plus receiving game of the year. Hunter caught 4 passes for 114 yards including a 41 yard long bomb from Fitzpatrick. The bad news is that Hunter had 3 drops. I know he is working hard on this issue and he has to do better. He absolutely needs a year in the offseason conditioning program and needs to hit the weight room. Kendall Wright didn’t have a great game but was apparently struggling through injuries to his shoulder and ankle. Wright was targeted 3 times and finished with 2 receptions for 17 yards. This despite playing 39 snaps. Nate Washington was the second most targeted wide receiver behind Hunter’s 8 with 6 targets and finished with 2 catches for 24 yards. Michael Preston who was recently called up from the practice squad had 1 target and 1 reception for 6 yards. I repeat myself but it goes without saying the Titans miss tight end Delanie Walker when he isn’t in the lineup. Newly acquired fill in Visanthe Shiancoe did about what you would expect playing 27 snaps. He was targeted twice and caught them both for 2 yards. Taylor Thompson played 29 snaps and was targeted once. He finished with no receptions. Craig Stevens played 11 snaps. All this leads me to the running game. The Titans ran the ball 21 times and finished with 92 rushing yards from their running backs. Chris Johnson carried the ball 12 times for 46 yards and a touchdown and averaged 3.8 yards per carry. Shonn Greene carried the ball 9 times for 46 yards and 2 touchdowns while averaging 5.1 yards per carry. Chris Johnson also had his second official lost fumble of the year. He should have been credited with the fumbled snap in the Jaguars game that was credited to Jake Locker, but I digress. There has been much discussion surrounding Chris Johnson this week after some media reports indicated he wouldn’t be back. Many who follow this team closely have been saying that for a while. It was clear they wanted to move on last year but just couldn’t since they are in “win now” mode. The struggles this year have sealed his fate. His chances to return are slim to none. His contract calls for an $8,000,000.00 salary and the Titans would have a cap hit of $10,000,000.00. His production with the Titans simply doesn’t warrant that kind of money. Which brings me to the Tommy Smith comments on Chris Johnson which I discuss in some detail here for Cover 3. Smith’s comments make sense for a team that doesn’t benefit from a player checking out. The team needs Chris Johnson to play well down the stretch for a variety of reasons. First and foremost, winning is important. Second, the Titans have to hope that Johnson has some trade value and perhaps he does. There might be a team out there thinking “man if we could get this guy in our system he could do really well.” Unlikely but possible. Finally, turning to special teams Leon Washington has done a really nice job for the Titans in his 2 games with the Titans. Signed to a one year deal, you wonder if there is interest on both sides in him returning next year. Something to keep an eye on. Also, punter Brett Kern had one of his best games on the season. Perhaps the altitude factored in but he did a nice job. He averaged 50.3 yards on 4 punts. On a side note, the Broncos only punted twice. Let’s face it the Broncos are a tough team to play, especially at home, and are simply a better team than the Titans right now. It’s nice to see players take responsibility after the game like defensive end Derrick Morgan and the team played hard until the end. The players seem committed to the process and understand they are in large part responsible for their plight. There is absolutely no evidence this team has checked out on head coach Mike Munchak. It remains to be seen how they respond down the stretch.